It was a busy weekend at Saratoga Speedway over the long weekend as the Black Creek oval hosted two days of Monster Truck action along with Mad Max, Crash to Pass, Road Runners and Hornet car racing. The 2 day weekend offered up 30 races producing 27 different winners as the competition within the classes continues to increase allowing for more drivers a opportunity to win on any given night. On Saturday night before the biggest crowd of the season the Napa Auto Parts sponsored night of racing saw 40 Hornet cars were in the infield and their races saw heat race wins in the Hornet B going Kyle Leonzio, Peter Leonzio, Chevy Carlsen and Kiana Westra while Chris Hleck won the B main with the A main going to Carlsen. In Hornet A racing heat race wins went to Darren Monk and Ryan Jensen with Luke Dixon taking the win in the main event. In Mad Max races Brad Dimtrov took the win in the heat race with Damon Dunn coming away with the main event while in Road Runner racing Ryan Guest took wins in both the heat race and main event. Rounding out the racing action were the Crash to Pass cars and race wins went to Troy Ordano in the heat while Ryan Monks took the win in the entertaining 20 lap main event. On day 2 Sunday night the Dunn Right Towing sponsored race night Hornet B racing saw heat race wins going to Jayden Rosner, Carlsen, Randi Joyce and Daniel Morrissey with main event wins going to Kyle Leonzio in the B main and Stephanie Addison came away with the win in the A main. In Hornet A racing heat race wins went to Brian Lippy and Stephane Parent while the 30 lap main event saw Michael White take the win in the weekends best race. In Mad Max racing point leader Danielle Antonik took the heat race win with Dunn winning his 2nd main event of the weekend while Guest repeated his Saturday performance by winning the heat race and main event in Road Runner racing. In Crash to Pass racing Cam Edwards made his return to racing this season a winning one by winning the heat race while Chris Campbell won his first ever main event. 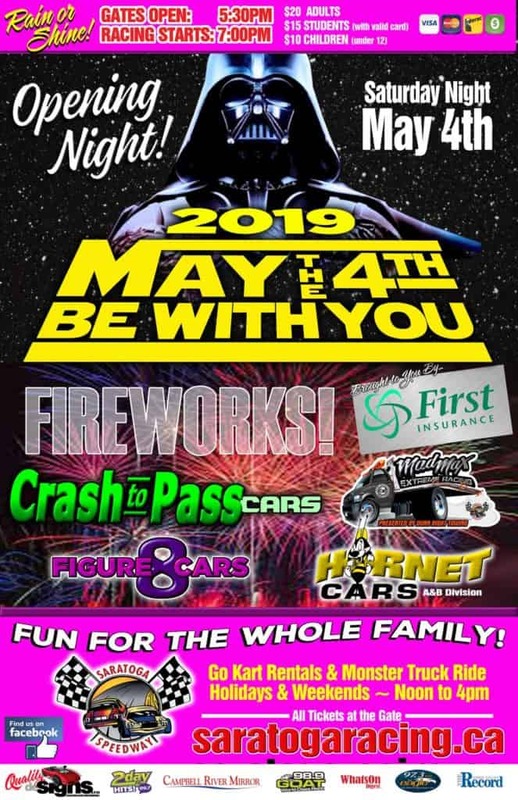 The Crash to Pass, Road Runners and Hornet cars return August 19th along with the Mad Max cars with special attractions being the first ever Limo car jump where a full size Limo will make a gotta see to believe jump into a stack of cars. A 2nd attraction this night will see the return of Crash to Pass Boat race the most popular race at the speedway and this will be a rain or shine event. After a weekend of mayhem speed returns to the track this weekend as the Modifieds return along with the Bomber cars and they will be joined by the always entertaining Mad Max cars. Heading into Saturdays racing Chris Beaulieu leads Travis Stevenson by 152 points in the battle for the season points championship while rounding out the top five are Peter Muloin, Jeff Monks and Dano Bryant. In the Bomber car points battle Boston Larson leads Chad Taks by 48 point with 3rd place Charlie Akerman tailing Larson by 110 points and in the Mad Max points race Antonik leads Dunn by 57 points. All Day Autocross. Hail, Rain, Snow, or Shine. Registration at 3pm, Autocross to follow. $45.00 per Driver, includes a transponder, $15.00 for pit passes. All Day Autocross. Hail, Rain, Snow, or Shine. Registration at 3pm, Autocross to follow. $45.00 per Driver, includes a transponder, $15.00 for pit passes. First Race on the oval May 4th. Fireworks, Hit to Pass cars, Dunn Right Towing Mad Max Extreme race cars, Figure 8 Cars, Hornet A and B Division. Rain or Shine. Sponsored by First Insurance and Dunn Right Towing. Bomber Cars, Hornet A Cars, Hornet B Cars, Road Runners.